I made my Shaman the night before retail release. After leveling a bit and connecting with the guild for some public quests and RvR scenarios, we decided to hit open world RvR. By the half-way point, we had a full warband. Smile for the camera, guys! 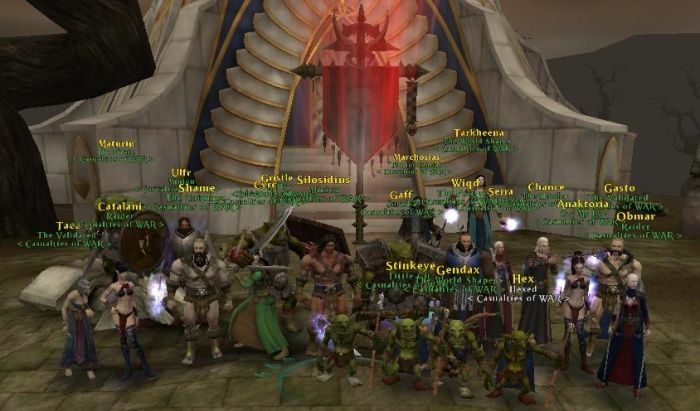 The night before the game went live, we had almost filled a 75-person Ventrilo server. I am not used to being part of a large guild. It is kind of nice. I have many voices to learn. I may go insane trying to match name to character name (across multiple alts) to blog name. For a gigantorious guild it does have a nice homey feel though. Here: Ysh = Stylish Corpse.